Quick and Efficient Navigation with the Informative Color Touchscreen Display - Large, resilient color touchscreen allows for effortless operation of the Scout through its informative icon driven menu structure, guiding the user through every step of the weighing application. 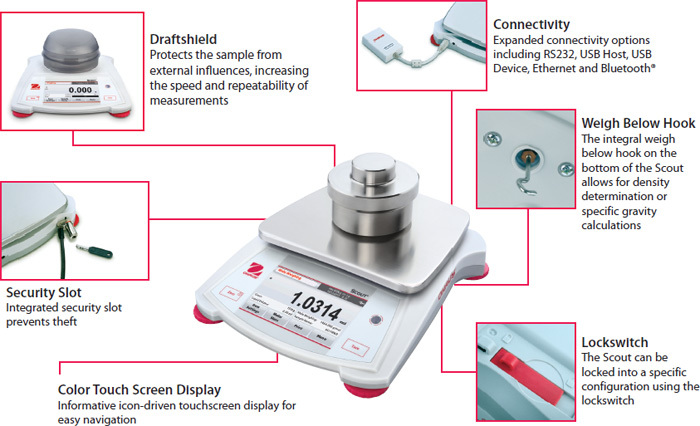 Fast Weighing Speed and High Resolution Deliver Repeatable and Reliable Results - Stabilization time as fast as 1 sec means increased productivity in your facility. 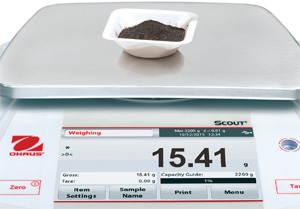 Equipped with advanced weighing technology, the Scout also ensures repeatable and reliable weighing results . 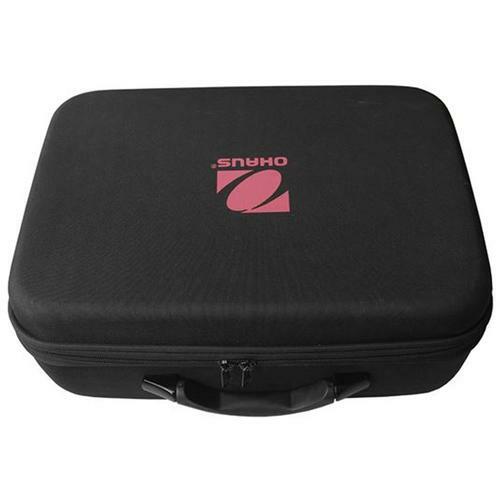 Superior Overload Protection & Stackable Storage Drive Overall Durability - Integrated superior overload protection system rated at 10 times the capacity protects the balance in rugged and demanding environments. 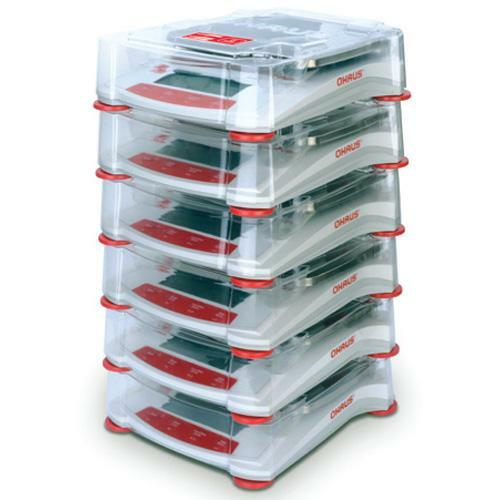 The space-saving, slim design allows for stackable storage. 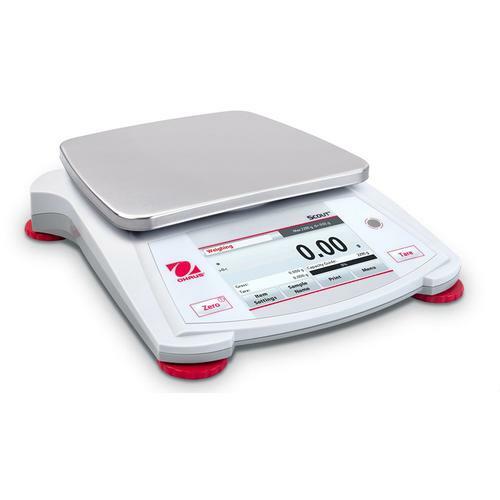 Portable balance operation has never been easier, faster or as intuitive as the new OHAUS Scout with color touchscreen display. 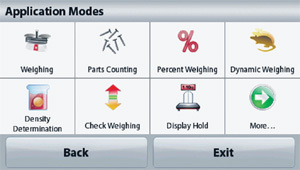 You’ll navigate easily through the Scout’s resistive touchscreen interface and icon-driven menu structure, maneuver efficiently in and out of application modes, change weighing units with a simple press of the screen and execute setup and calibration functions in no time. 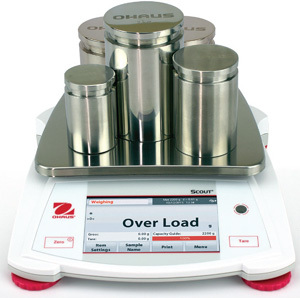 The OHAUS Scout with color touchscreen display creates a new level of unmatched efficiency and functionality in portable weighing. 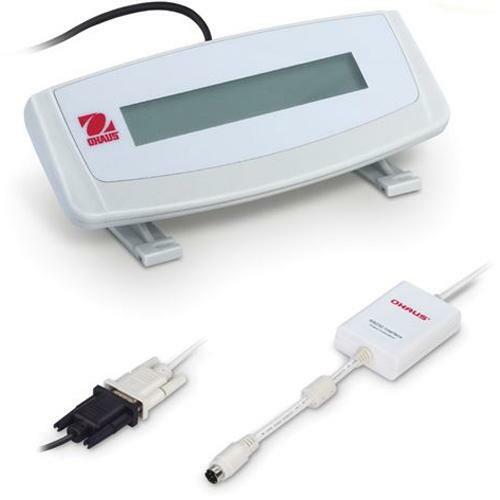 A real-time clock function keeps accurate time even during power loss. 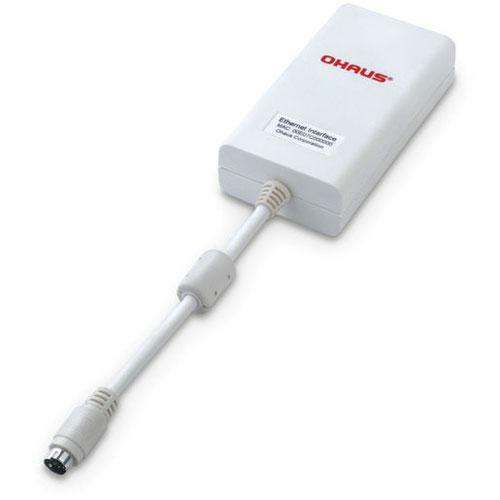 Additionally, GLP/GMP tracking capabilities assist in the monitoring and reporting of data. 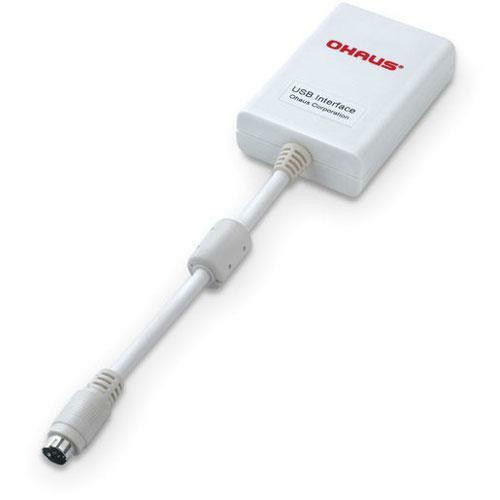 It’s all about accuracy and efficiency with the OHAUS Scout Touchscreen balance. Stabilization time as fast as 1 sec means increased productivity in the lab, or on the line. 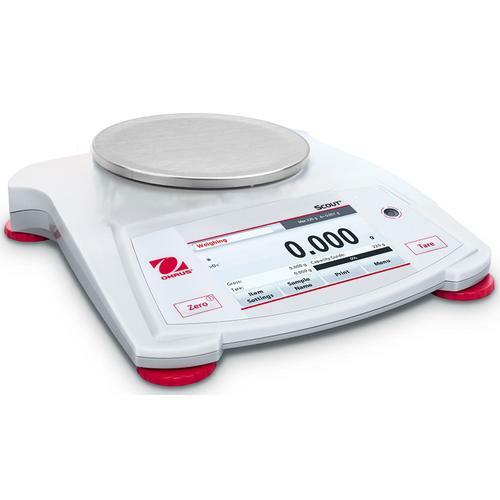 With improved resolution, you can count on extremely precise and repeatable weighing results time and time again. 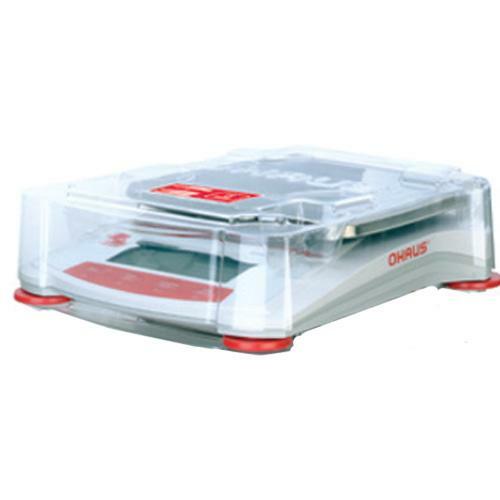 You would expect nothing less from OHAUS than the most durable portable weighing product - that’s why we’ve included our superior overload protection rated at 10 times the capacity of the balance, high strength stainless steel pan, impact-resistant pan support and integrated transportation/storage lock. We’ve even ensured that the high quality, resistive touchscreen is built to last. To complement our signature durability, the Scout Touchscreen is designed to be stackable when utilizing the included stacking and storage cover, which also protects the balance when not in use. Versatile Data Collection and Transfer With expanded connectivity options now featuring Bluetooth®, the OHAUS Scout offers more versatility for convenient data logging, communication and remote functionality. 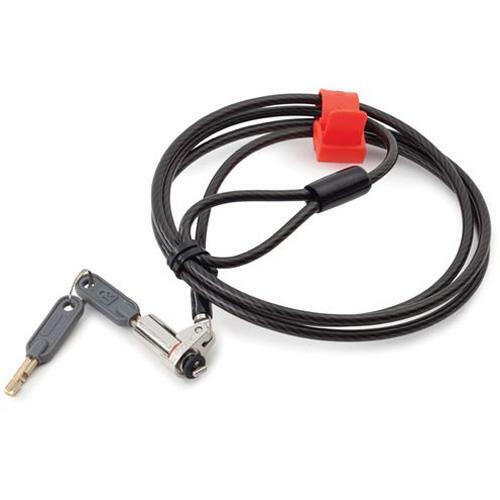 Utilize the Bluetooth® accessory to remotely control the balance from your mobile device or tablet for Android™*. 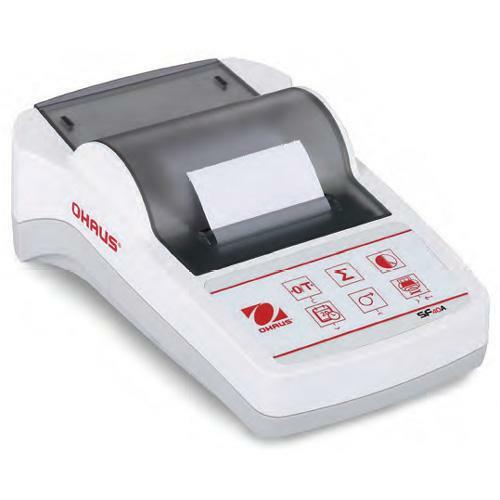 Perform functions such as Zero, Tare, Print, Power Off and more. 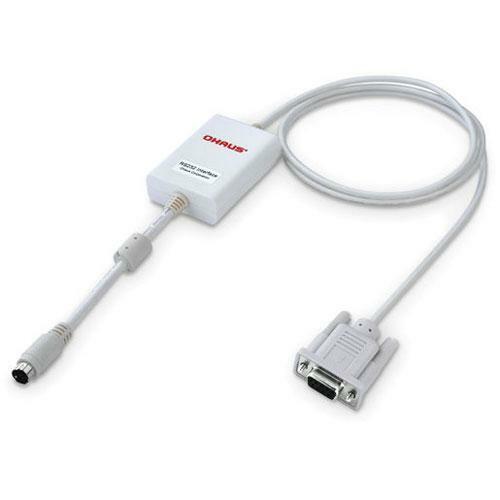 Other accessories include RS232, USB Device, USB Host and Ethernet. 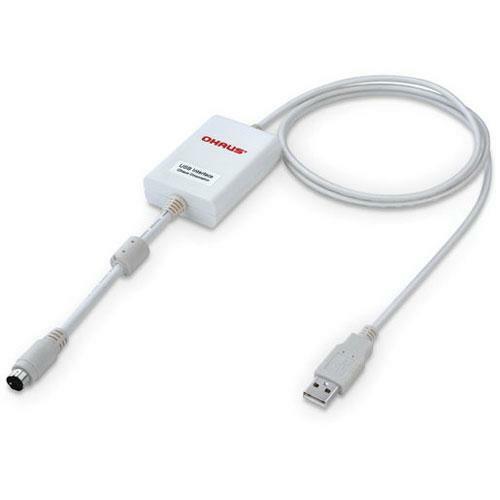 With the USB Host option, you can simply save and transfer data from the balance to a USB drive. 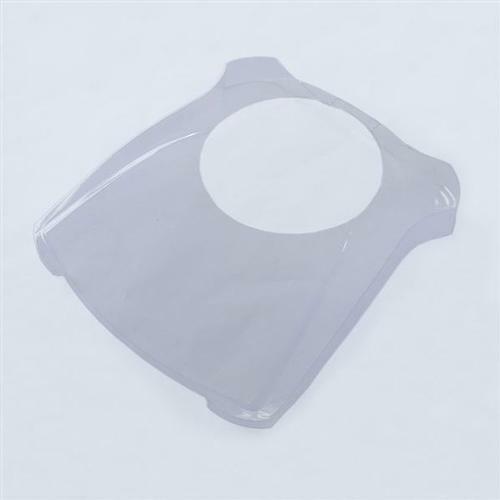 Draftshield Model Available Scout’s ingenious draftshield (1mg models only) was designed with an easy to remove top cover piece. 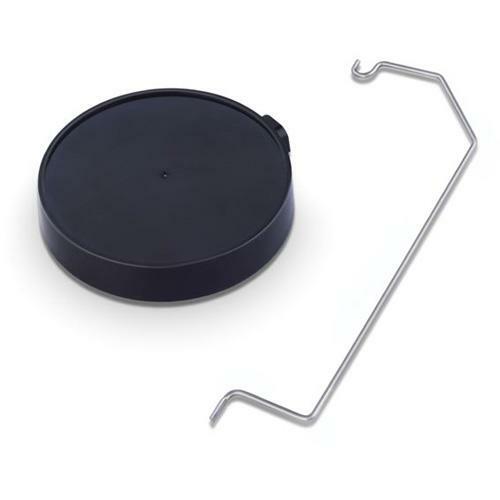 This serves as a wind protection ring which keeps the weighing surface stable in rough environments, while maintaining weighing speed. 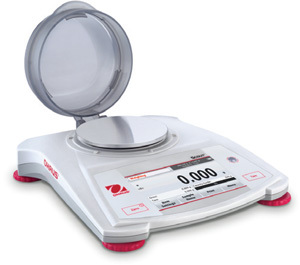 Dynamic Weighing - Weighs an unstable sample load. The balance takes an average of weights over a period of time. 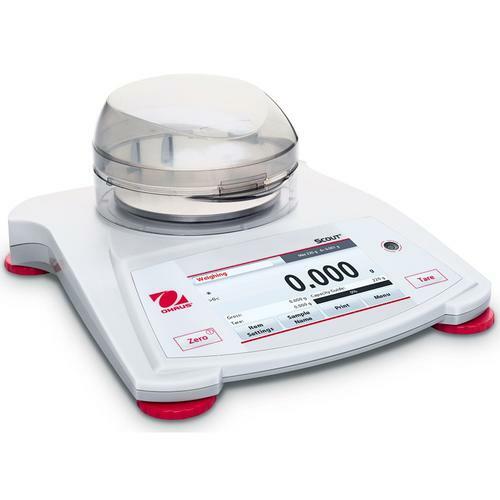 Mole Weighing — Measures the weight of a sample and calculates it into Moles automatically.